This is a easy chicken curry recipe. 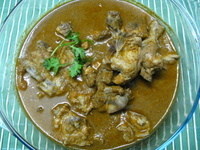 There are many ways to cook an Indian chicken curry. I find this recipe very convenient, as all you need to do is blend the ingredients and cook till done. Pretty simple. The flavors are amazing too. Heat a non stick pan, add the dry ingredients in it (without any oil) and on the lowest flame, roast them, stirring constantly. This would take a minute or so. When light brown in color, turn off the heat. Let it cool. 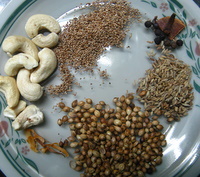 Yes, blend the roasted dry ingredients and the wet ingredients together until smooth. Use very little water if need be to grind them. Heat oil in a cooking pot (non stick is best). Slowly pour the blended puree in it. 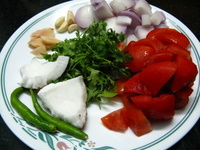 Cook on a medium to high flame, till the masala gets cooked, dry and oil becomes visible on the sides. Be careful as it will spatter until l the water dries. Cover it with a steel mesh cover if you want. Now add the salt, chili powder (if required) and the chicken pieces. Mix well and cook on a high flame in the masala till the chicken pieces get coated well. Add a cup or so of water and cook till the chicken is done. Adjust the gravy to your liking. Garnish with fresh coriander and serve hot with chapati or rice.